Frontispiece. 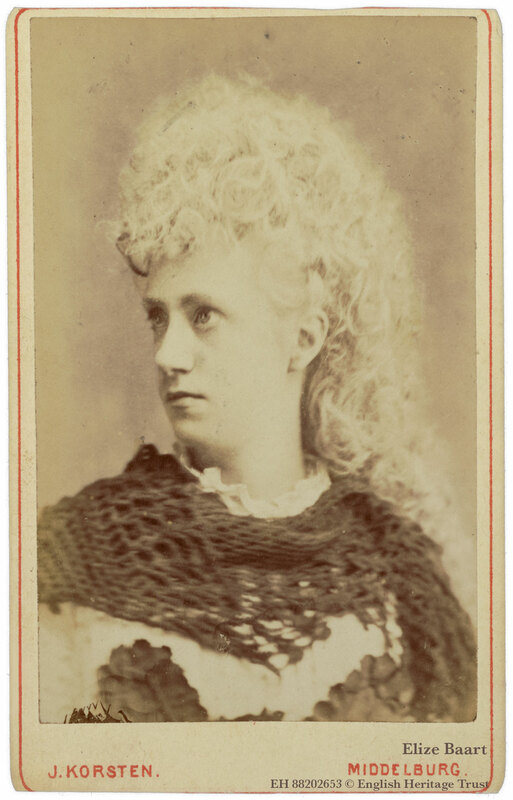 Dutch album (EH 88202653). Harting had also written an account of Darwin's work for Album der Natuur. The album was luxuriously bound in red velvet with silver embossing. 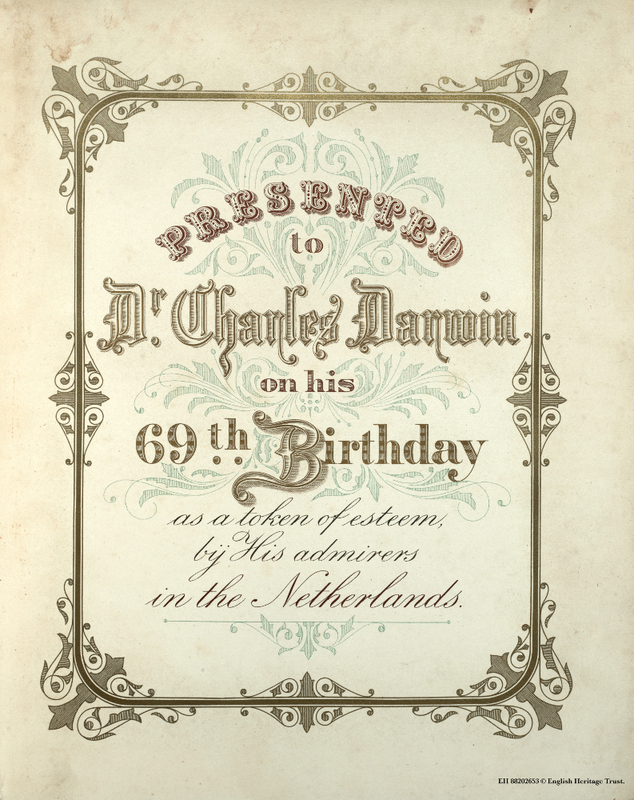 The frontispiece contains a mistake about Darwin’s age: it states his ‘69th Birthday’, when in fact he was 68 in 1877. It was arranged in alphabetical order, and the photographs were all equal in size, being small cartes de visite, displayed four to a page. Images: © English Heritage Trust. Delivered by: Cambridge University Digital Library. Scroll through the list of Album Contents on the right, and click on an entry to jump to the page. The pictures were removed at some point in the object's history and the fronts and backs are displayed here on black pages in the configurations that they would have appeared in the album. Sample pages from the empty album are also included. Accompanying the album was a handwritten list of the 217 people included, with their professional title or occupation. The contributors were apothecaries, merchants, high-school teachers, and artists, as well as scientific and medical professionals. The album included several women. The Dutch friends so prized Darwin’s reply that they sent him a photograph of the two of them with Darwin’s letter. 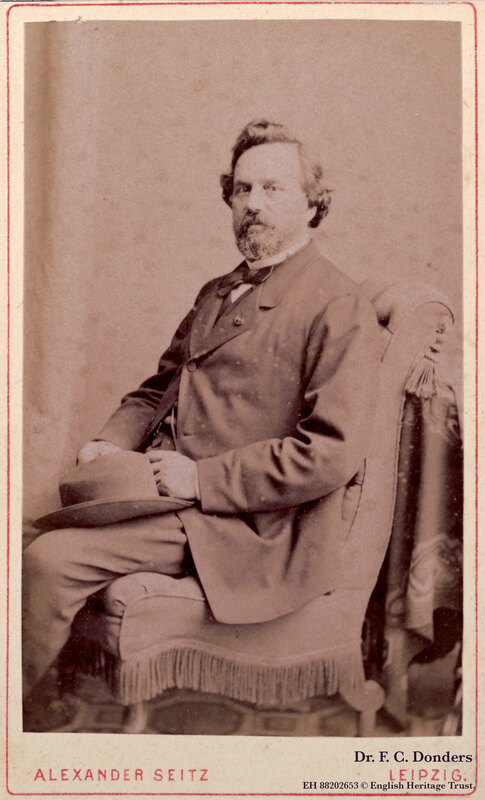 Another young man, Theodor Wilhelm Engelmann, the son of a scientific publisher in Leipzig, had provided Darwin with the woodcuts he needed for an English translation of Fritz Müller’s work before he became professor of biology and histology at Utrecht. Zouteveen’s editions of Descent and Expression contained explanatory notes at the end of every chapter, which Darwin asked his son George to translate into English. Heide, Janneke van der. 2009.Darwin en de strijd om de beschaving in Nederland, 1859–1909.Amsterdam: Wereldbibliotheek. Expresses sympathy [on death of FCD’s daughter]. Will be grateful for his paper and letter. A letter from CD’s admirers in the Netherlands, sent with an album of their photographs, in celebration of his sixty-eighth birthday. Presents an account of early efforts in the Netherlands in the direction of developmental theories, and evidence of the support and enthusiastic reception given CD’s theory. Expresses his gratitude for the gift [a birthday album from a number of Dutch scientists]; he cannot imagine a more honourable testimonial. Dutch physiologist and ophthalmologist. 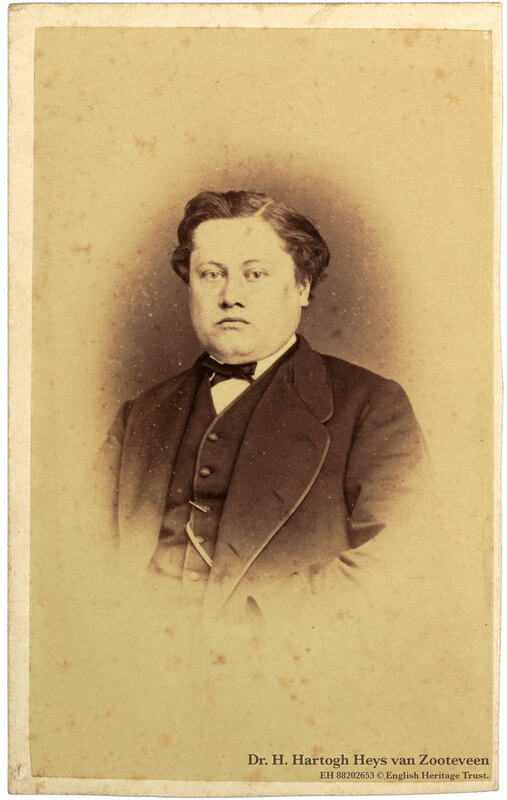 MD, Leiden, 1840. Professor of anatomy at Utrecht military school; professor of physiology at the University of Utrecht, 1862. President of the science section of the Royal Amsterdam Academy of Sciences, 1865–83. 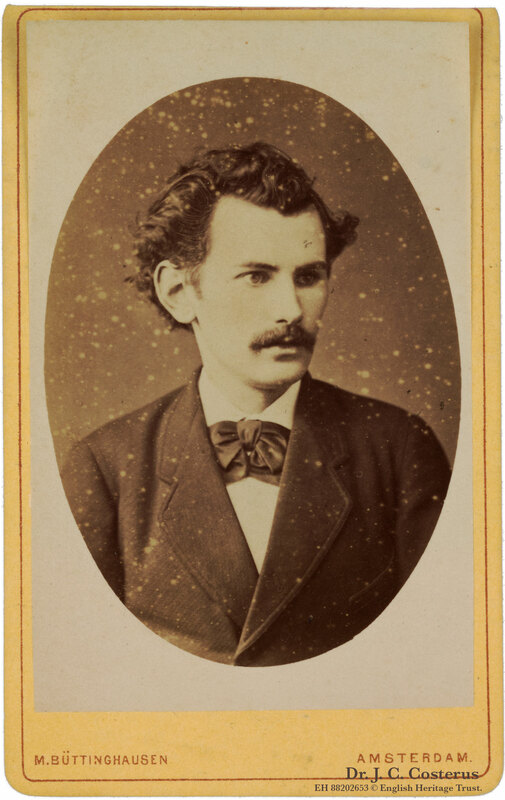 Founder and director of a physiology laboratory at the University of Utrecht, 1866–88. Founder and director of the Netherlands Hospital for Eye Patients, 1858–83. FRS 1866. Dutch zoologist and microscopist. MD, Utrecht, 1835; doctorate in obstetrics, 1837. Professor of pharmacy at the Athenaeum, Franeker, 1841; of zoology, Utrecht, 1846–82. Dutch naturalist and geologist. Translator and champion of CD’s work in the Netherlands. The album is now in the English Heritage Trust collection at Darwin’s home, Down House, in Kent. It is made available through a collaboration with English Heritage staff and Cambridge Digital Library. Very little is known about many of the people featured in this album. If you can help to identify any of them, please get in touch.